NSU Prinz/NSU Prinz II/NSU Prinz III/NSU Prinz 30/NSU Prinz 30E (Typ 40). 1958–62 (prod. 94,549). 2-door saloon. R/R, 583 cm³ (I2 OHC). Surprisingly competent minicar with unitary construction, with 20 PS from original base model, shown at the IAA in 1957, with production commencing the following March in a single colour. Noisy and harsh, although NSU attempted to improve things during the run. Spartan on the inside, but it had 12 V electrics. 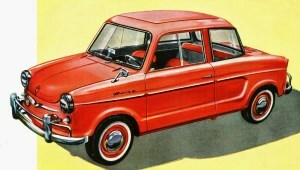 Prinz II from 1959, a deluxe version that was sold alongside the original model, with fully synchronized transmission and more exterior colours, including a two-tone option. Sporting version called the Prinz 30, from April 1959, with higher compression (7·6:1 rather than 6·8:1) and a larger carburettor. Slightly more sophisticated Prinz 30E for export. Prinz III from 1960, replacing II, now with 23 PS, with further upgrades; 30 models followed suit with their specifications.